At Oasis Digital, we have spent much of our effort over the last several years creating complex “single page” web applications. There is much to say about that, but today I’m writing about one specific sliver: styling the application pages with CSS. To do good work at scale when using CSS to style an application (versus a one-off “webpage”), the only path to success is to take CSS seriously as a language, and study how to use it in an idiomatic, semantic, maintainable way. Unfortunately, thinking about CSS in this way is considered far into “advanced” CSS territory, and these topics received almost no attention from the countless online and off-line resources to learn CSS. What does it mean to take CSS seriously? Briefly, it means learning the technology and patterns of use in depth, by studying what others have done and thinking about why and how to solve problems. CSS written by experts tends to follow many idioms. These are patterns that have been found useful again and again: a consistent order of selectors, consistent use of white space and other formatting, and so on. There is a popularly cited online resource explaining some of the most common idioms, and A List Apart (which you should probably read extensively) has a busy topic area around CSS. Do you always use the same browser, with your window the same size, with the same settings? Then your CSS is probably not robust at all. It is quite easy to accidentally style in such a way that the slightest disruption in the layout causes unexpected unpleasant results. The way to robustness is exposure to ongoing change. Use multiple browsers, and switch often. Adjust your font size every day up or down, for a good reason or no reason. Change the width and height of your browser window, don’t just always leave it maximized at whatever very common screen size you happen to use. Do you work on a PC? Try a Mac sometimes. You work on a Mac? Your CSS-styled pages probably change in some minor but irritating way if you haven’t looked on a PC. Good CSS is robust. It is specified sufficiently but not over-specified. A particular anti-pattern to avoid: layout some elements; observe their width on your particular browser and settings; set the width of an element that is supposed to contain them to a hard-coded number based on that single observed width; then watch what happens when some minor difference in font or other matter makes something a little bit wider than you expected. A hammer is a great tool, but not every problem is a nail. Grid systems are wonderful, but not for every element on every page. To take CSS seriously, we must learn when and where to use grid systems, ad hoc floats, that shiny new flexbox, and even an old-fashioned table. 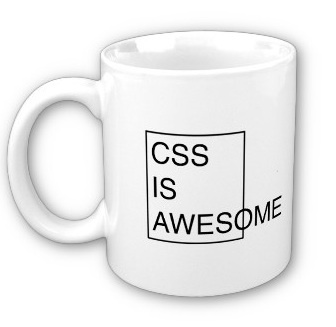 Many projects today start with a CSS framework like Bootstrap or Foundation. Working in this context requires a keen awareness of how your CSS interacts with that provided by the framework. It is common to see CSS which randomly and arbitrarily overrides rules set by such a framework, with no regard for what sense those framework provided rules made. The typical result: layer upon layer of overrides, trying to fix a resulting problem by adding layer upon layer of of more overrides. The key to winning this battle of layers is to stop fighting. To use the delete key extensively, trimming away excess CSS to fix problems rather than adding more. Adjust variables provided by your framework, instead of ad hoc overwriting its calculated class attributes. Understand exactly what layers are needed and why. “Semantic” means “pertaining to the meanings of words”. But the problem many of us have around semantics isn’t so much of wrong meaning, but of applying the wrong names to the right meaning. Thus allowing the CSS user to type class=”float-right” instead of style=”float: right;”. This of course misses the point of the admonition against in-line style completely. It is not the literal use of the style attribute that is the problem, it is that the idea behind CSS is to mark up content with classes which say something about what the content is, then use CSS separately to apply a visual layout and so on. If you can look at the name of a CSS class and know exactly the style settings it contains, it is probably not a very good name. But if you can look at a piece of content, and tell what CSS class you should apply based on what kind of content it is, you probably have a very good name. Did I mention, don’t actually write CSS itself? CSS is lacking critical facilities for abstraction and removal of duplication. There are persuasive arguments floating around that CSS is too broken to ever be fixed; and I would not argue against that. But given that we are mostly stuck with CSS for many types of applications, it is necessary to use a layer on top of CSS. The usual contenders are Sass and LESS. This means that all of these goals mostly apply to the Sass or LESS you write, rather than to the CSS generated from Sass or LESS. People who have studied both usually conclude that Sass is a better choice than LESS, and indeed the former is what we most often use. The net result of all of the above is maintainable CSS. CSS which you can keep adding to, in an incremental way, as the application you are styling continues to grow and improve. CSS which you or someone else can understand a year later. CSS which you can be proud of when someone looks under the hood. CSS is not ideal; it has gradually accumulated features since the emergence of the web and therefore has legacy concerns, among other problems. The CSS to solve any particular problem might not be able to meet all of these design qualities at the same time. Therefore, good quality CSS strikes a balance: semantic enough, robust enough, idiomatic enough, and so on. Some of the ideas here sound like they could take a long time to code – but good CSS is faster to complete – bad CSS burns up far more hours than good, in the quest to create a finished system. Of course, mastering tools can take a long time. The payoff is that a master usually creates code (CSS or otherwise) with high “first time quality”. At Oasis Digital, we are not perfect. We do not yet do all of these things perfectly all the time; there is sometimes a tradeoff between delivery speed and polish. But we do take CSS seriously, and we work hard to move in the right direction along all these axes.